Some of you reading have likely just passed your licensing exams and are just starting off in your new career. One of the last things you are probably thinking about is retirement. However, now, more than ever, is the best time to start saving for retirement. If retirement is decades away, why do people make a big deal about starting now? USA Today revealed a study that demonstrated two-thirds of Americans do not know how compounding works. (1) I will save you the math, but basically: the earlier you start saving for retirement, the better. Particularly, the first years can make the biggest difference. The key concept is to start early! A simple way to begin investing for retirement is through your employer’s 401(k) plan, if available. Typically, an employer-sponsored 401(k) will also have preset funds or allocations, so you usually do not have to worry about selecting specific stocks, bonds, ETFs, or mutual funds. At the very least, take your employer’s 401(k) match. By not doing so, you are literally throwing away free money from your employer. My first job did not offer a 401(k), but even so, I still regularly contributed to my Roth IRA (Individual Retirement Account). An IRA is a way for individuals to begin to invest for retirement on their own. There are two common types of IRAs: Roth and Traditional. The main difference between Roth and Traditional is when taxes are taken. In a traditional IRA (or 401(k)), taxes are taken when you withdraw your money in retirement. In a Roth IRA (or Roth 401(k)), you use your post-tax dollars (i.e. money from your paycheck after taxes are taken out) but do not owe any taxes when you withdraw your money in retirement. If you are in a lower tax bracket now compared to when you will retire, the Roth option might be best for you. If you are in a higher tax bracket now compared to when you will retire, the Traditional option might be best for you. How do I get started with an IRA? Betterment offers a self-run “robo” IRA which might be best for those who do not wish to choose different funds to invest in (https://www.betterment.com/401k-and-ira-rollover/) Otherwise, other big-name brokerage companies, like Scottrade offer ways to open your own IRA as well. Different funds to choose for an IRA can be overwhelming. And you will get different advice from everyone you talk to. However, there are a few fan-favorites out there. But of course, I am not here to recommend any specific stocks, bonds, mutual funds, or ETFs. It is best to do your own research and see what fits best in your own individual portfolio. Furthermore, a chat with a financial advisor might be helpful for this particular subject. But what if I have student loans? So now that I know the importance of investing for retirement, how much do I actually need to save? To invest for retirement, you may need to re-tool your budget, as statistics show 47-73% of Americans are living paycheck-to-paycheck.18 I highly recommend using a free budgeting app like Mint or Personal Capital. With these, you can easily see over time where your money is going. Some people also find different types of monthly budgets to be useful, such as the 50/30/20 Plan(21) and Envelope System(22). You could save some money by reducing or eliminating monthly expenses. A popular option among Millennials, and even some older people, is to get rid of cable (costing roughly $100 per month, on average) in favor of streaming services like Netflix (about $10 per month) and using an antenna for local channels. Unless you insist on having those 300+ channels at your disposal, this money move alone can save you over $1000 a year (and a lot of headaches on the phone with the cable company). Also, take a look some other monthly subscription services you might not be taking full advantage of, such as Spotify, SiriusXM, workout classes, Blue Apron, etc. Reducing or eliminating a few of these monthly expenses can free up a little extra money each month. Bringing your lunch to work instead of eating out is also a great way to save money each week. A couple bucks a week might not seem like much, but it can really make a difference in the long-run. For example, saving just $10 a week can lead to over $500 saved in one year. Another way to save some cash is buying a used car versus a new car. In particular, many new grads like to reward themselves for all those years of school with a brand new car. And while a new car is nice, it will cost you a lot more in the long-run. The average 5-year car payment for a new car is roughly $500, while the same payment for a used car is roughly half that amount. Bottom line: New cars are nice, but with a new car, you are paying more for an asset that is dropping quicker in value as opposed to a used car. With a used car, you are paying less (compared to a new car) for an asset that is dropping in value more slowly than a new car, as most of the depreciation has already been done (a win-win financially!). This seems like a lot to manage… Would a financial advisor help? All this info above regarding retirement assumes that you will be working until at least 59.5 years old. This is the earliest you can start taking withdrawals from your retirement accounts without penalties. If you do desire to retire earlier, then you definitely need to start saving and investing a bigger chunk of your paycheck early and often. You will also need to look into brokerage accounts and/or other retirement and investment vehicles. Therefore, in these cases, a free consultation by a financial advisor may help. Note: Will Butler, DPT is a PT-turned-financial advisor (we prefer to call him a clinicians' advocate) and he's always available for free phone consults, too. 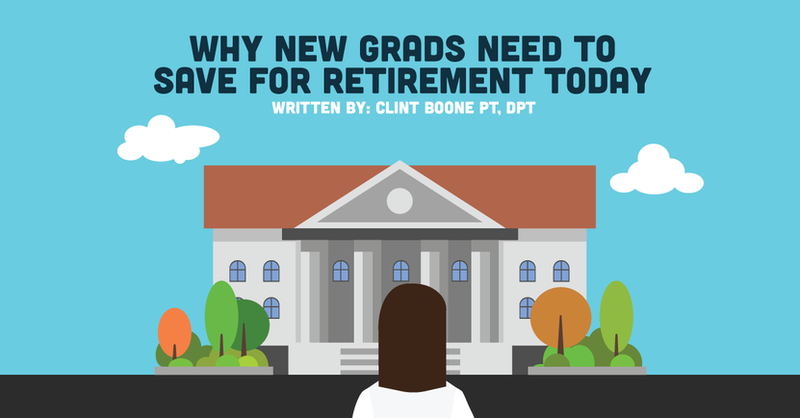 As a physical therapist, my older patients often talk about their retirement during our sessions. Some patients are set for retirement since they started saving young, and remind me to continue to do the same. Other patients did not save early for retirement, and now, they will either be working well beyond the retirement age or scrimping to get by when in retirement (if they can even work at all, depending on their health). They too, also tell me to keep saving now as a young adult. None of my older patients ever regretted saving too much for retirement. Backman, M. USA Today. Compounding: 66% of us don’t understand crucial financial concept. 6 June 2016. Available at https://www.usatoday.com/story/money/personalfinance/2016/06/05/compounding-financial-concept-saving/85295910/. Accessed 30 August 2017. Kiersz, A. Business Insider. Saving at 25 vs Saving at 35. 25 March 2014. Available at http://www.businessinsider.com/saving-at-25-vs-saving-at-35-2014-3. Accessed 1 September 2017. Campbell, H. Mint.com Think It’s Too Early To Plan for Retirement? Wrong!. 25 August 2017. Available at https://blog.mint.com/planning/think-its-too-early-to-plan-for-retirement-wrong-082517/?utm_source=iosapp. Accessed 4 September 2017. Hogan, C. Chris Hogan. When Should I Start Saving for Retirement? 2017. Available at https://www.chrishogan360.com/when-should-i-start-saving-for-retirement/. Accessed 22 September 2017. Frankel, M. The Motley Fool. Roth IRA: Pros and Cons of this Tax-Advantaged Retirement Account. 18 March 2017. Available at https://www.fool.com/retirement/2017/03/18/roth-ira-pros-and-cons-of-this-tax-advantaged-reti.aspx. Accessed 7 September 2017. Turner, M. Business Insider. Warren Buffett Best Investment advice on Low-Cost Funds. 4 MAy 2017. Available at http://www.businessinsider.com/warren-buffett-best-investment-advice-on-low-cost-fund-2017-5. Accessed 23 September 2017. Investopedia. Target Date Fund. Available at http://www.investopedia.com/terms/t/target-date_fund.asp. Accessed 24 September 2017. Kumok, Z. Stash. “I Paid Off My Student Loans in Three Years! Did I Make a Mistake?” 14 August 2017. Available at https://learn.stashinvest.com/paid-off-student-loans-investing. Accessed 9 September 2017. Wiles, R. USA Today. Want Financial Success in Retirement? Choose Wisely. 6 October 2017. Available at https://www.usatoday.com/story/money/personalfinance/2017/10/06/want-financial-success-retirement-choose-wisely/710077001/. Accessed 6 October 2017. Elkins, K. CNBC. Here’s How Much the Average American Family Has Saved For Retirement. 12 September 2016. Available at https://www.cnbc.com/2016/09/12/heres-how-much-the-average-american-family-has-saved-for-retirement.html. Accessed 1 September 2017. Peach, C. Grow from Acorns. Stop Saying You Don’t Earn Enough to Retire a Millionaire. 7 September 2016. Available at https://grow.acorns.com/how-to-retire-a-millionaire/. Accessed on 3 September 2017. Shin, L. LearnVest. How to Budget Your Money: The 50/30/20 Guideline. 30 June 2014. Available at https://www.learnvest.com/knowledge-center/your-ultimate-budget-guideline-the-502030-rule/. Accessed on 17 September 2017. Ramsey, D. Ramsey Solutions. The Envelope System Explained. Available at https://www.daveramsey.com/blog/envelope-system-explained. Accessed on 29 September 2017. Reed, P. NerdWallet. Compare the Costs: Buying a NEw Car vs. Used. 28 April 2016. Available at https://www.nerdwallet.com/blog/loans/compare-costs-buying-new-car-vs-used/ Accessed on 23 September 2017. Elkins, K. CNBC. Couple that Retired in their 30s Share Their No. 1 Money Saving Tip. 10 April 2017. Available at https://www.cnbc.com/2017/04/10/couple-that-retired-in-their-30s-share-their-no-1-money-saving-tip.html. Accessed on 11 September 2017.